Get the most of that often-seen personal branding space: your email signature. 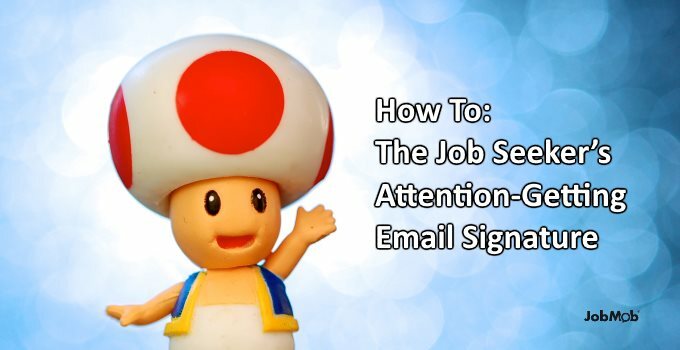 You've got your job search email address, but do you have a memorable email signature for it? 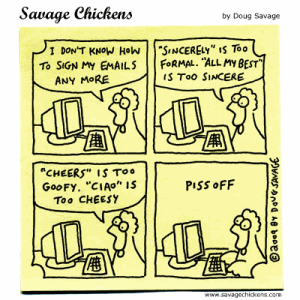 Do you currently have an attention-getting email signature? Salutation – using your email signoff to only say goodbye is a wasted opportunity. Either use an expression that's relevant to your personal brand or wish the person something positive. The best result is a combination of both that doesn't sound too cheesy. In my email signature, I usually say “To your job search success”. Title(s) – if employed, use your current job title. If you're currently unemployed, list your profession and add “available for full-time employment”. Organization – the organization you most associate yourself with, typically your employer, a professional association you're prominent in, or your own company. Association Membership – any professional or industry-related association that you are a member of, worth mentioning especially to people who are likely to recognize it. Phone numbers (mobile/land/fax) – just put the one number you want to be reached at; some people include both their landline and mobile/cellphone numbers, but that's overkill. If you have a compelling reason to include more than one number, put each on its own line with a label to indicate which it is such as “Tel: 555-1234” and “Cell: 555-5678”. If most people who contact you are on Skype and you prefer it, use the Skype callto: syntax so that calling you is just one click away. Website/Social media profiles – use the one url (at least) that most builds your personal brand i.e. is most likely to impress viewers. This might be your blog, your organization or association membership profile (see above), social media resume or one of your social media profiles. At minimum, list your LinkedIn vanity url. If you're not sure which urls to use, list 2 or 3 but use a url shortener such as bit.ly that lets you customize the shortened url while also counting the clicks so you can measure which url people clicked more. Check the click statistics after a month of usage and then decide which urls to leave in your signature. Like with LinkedIn, use your Facebook vanity url if you decide to include your Facebook profile in your email signature. Important: include ‘http://' in each url in your email signature so that the recipient's email software will automatically make the url clickable. Image – of all the items on this list, an image is the riskiest thing to include in your email signature because it will increase the download size of every email you send (and many of the replies you receive) and will often get flagged by email software as a potential security issue, increasing the chance that your email won't even be seen by the recipient. However, if you are willing to take the risk, it will be because you have a memorable image to show, a brand-relevant image that best represents you, such as your personal logo, a picture of your latest book or other product if you have one, or even your avatar. Subscribe to JobMob via email and follow me on Twitter for more ideas on how to get contacted on your job search. In response to a question by Becky, I updated the article to include that job seekers should say ‘available for full-time employment’. Fantastic–your solution takes all the inherent desperation out of being a job seeker. some stuff is so easy to make up! Great how-to article, Jacob. I just had to add this, since I saw it recently. A job seeker had a quote from himself (with a date from years ago) using an outdated phrase. PLEASE be careful to use Jacob’s suggested format or something close to it. And don’t add anything as a tagline or cute quote that an employer might label YOU with!